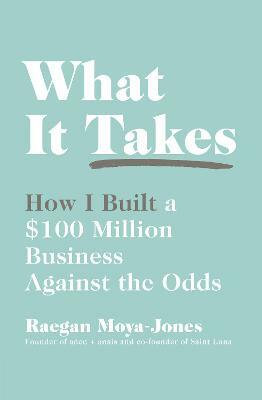 When Raegan Moya-Jones was told by her overbearing male boss that she didn't have an 'entrepreneurial bone' in her whole body, she almost laughed in his face. What he didn't know was that the business she'd been secretly working on in the small hours of the night after putting he... read full description below. When Raegan Moya-Jones was told by her overbearing male boss that she didn't have an 'entrepreneurial bone' in her whole body, she almost laughed in his face. What he didn't know was that the business she'd been secretly working on in the small hours of the night after putting her baby to bed, had just hit revenue of $1 million. Today, aden + anais, the swaddling blanket and baby goods company Moya-Jones founded is a global, multimillion dollar franchise and one that Beyonce, Gwen Stefani and the Duke and Duchess of Cambridge loyally support. In this clever, relatable and iconoclastic success story, Moya-Jones busts every myth and misconception about women in business and argues that women should embrace the attributes that set them apart from men. Blanket conventions and perceived barriers attached to the female entrepreneur can be transformed into assets and profit - all you have to do is take the leap. Raegan Moya-Jones is the co-founder and CEO of aden + anais, an award-winning, family-friendly lifestyle brand globally renowned for its superior-quality muslin swaddles and baby products. The company has headquarters in New York, the UK, Japan and Australia. She is the winner of the 2014 EY Entrepreneur of the Year award, and a board member of the Enterprising Women Foundation. Originally from Australia, Raegan now lives in Brooklyn with her husband and four daughters.